Avert Your Eyes, Cat Haters! I try very hard to not get all mushy gooshy about my cats. I know there are many people who could care less, but they are my babies, at least for the time being, until I have human babies (if I have them), and then they will be my oldest children. So, to not brag and chatter on inssesantly about them is quite hard. Today, you will just have to suffer. I have been wanting to tell you some things about them and their predecessors for quite some time. To understand who I am you need to know these things. First, let me give you some background. I have had cats in my life since I was two days old. My first word was Annie (I pronounced it Onnie), after our Manx/Tabby cat. We then had a stray cat have a litter on our roof, when I was about two, and my mother took them all in. The mother was named Foo Cat after the family we think left her behind, and she had 5 kittens. Three were given away, and two we kept. Blackie (who later was renamed Magic after she survived getting hit by a car) and Girl Cat who had been the only female cat we were trying to get adopted (Magic was a girl, but we wanted to keep her). No one wanted "the girl cat" and we wound up with her. The name stuck and eventually she became Girlie. Girl Cat and Magic were with us until I was a junior in high school. Girl Cat was my cat. We had a very special bond. She let me do anything to her. I have very pleasant memories of dressing her up in doll clothes, flipping her over and laying her in my doll stroller and pushing her around the house. I seem to recall having to hold her in the stroller with one hand while pushing with the other...something about her not liking being in there, but I always ignored that. There was also the time a neighbor girl convinced me it was a good idea to put her in two waste baskets. They were wicker baskets with holes all over. We put her in the bottom one (she didn't fit well) and then put the second one on top upside down, a sort of egg shaped cage. My mother came in and saw what we had done and boy was I in trouble! Magic died when I was a junior in high school of a tumor on her hip. After Girlie died suddenly of a tumor that had essentially suffacated her heart (cats are amazing at hiding their symtoms) we waited about a year to get new cats. I was working at Petco at the time and a sweet little teensy black kitten came in for the adoption cage. After two days of watching this sweet little thing climb the bars of the cage, I called my mother from work and told her to come over and see it. She was very reluctant, but came at the request of her daughter. She fell in with him as quickly as I did, and we adopted him. Tommy was the sweetest kitten. He loved fresh litter. He would wollow in it for hours! Eventually, we gave him two litter boxes. One to use, and one to play in. He understood the difference. One night I was sitting in the livingroom and saw something out of the corner of my eye. They way the livingroom patio door and the kitchen nook are set up, you can see from the living room through the door and into the nook through a window. As I glanced over, I saw a black thing, swinging in the window. I relized almost instantly that it was Tommy. I ran around into the kitchen and grabbed him. He was dangling from the window blind cord. It had gotten wrapped around his tiny neck and he was hanging himself! I untangled him, and conforted him. He was obviously a bit shocked, and was very calm. At first we thought he might have cut off his air supply long enough to give himself brain damage, but he turned out to be one of the smartest cats I have ever seen. He literally stares at things and processes how to get them. You can practically see the wheels turning. About three months after getting Tommy, Another kitten came into Petco that I couldn't resist. He was a tortoise colored Manx and he had shat all over himself on the ride over he was so scared. Poor little guy. I couldn't help but like him! Even if he did stink to high heaven. I called my mother again, and she came over slightly less reluctantly this time. The Manx was still being cleaned up and they had just finished with his carrier mate, a fluffy orange and white longhair. My mother took one look at the Manx's victim and couldn't resist. I lost the battle for the Manx, but we got Cody instead. Cody and Tommy bonded almost instantly. They are still best of friends. Cody however, is possibly the dumbest cat I have ever met. He just stares up at you with his big, perfectly round, gold eyes with the permanent look of, "huh?" plastered to his face. He always looks lost. Like he just doesn't know how he got to where he is. If he was human, he would be the beautiful dumb blonde. Almost immediately after I went off to college, I began to feel like something was missing. I had had pets my entire life. On top of all the cats, we always had a dog as well. I tried to subdue my emptiness with other pets. In the dorm, and for the next two years I had fish. At Christmas time, I would remove half the water, line my rear car seat with towels, put the fish tank in, strap the seat belt around it, and drive the fish home. Sloshing all 215 miles. At some point all the fish died and my senior year I got a corn snake, named Pheonix. While I had Pheonix, I began to really wish I had a cat again. I was living alone so there was no one to ask permission of. My boyfriend at the time, knew how much I missed having a cat, and for Valentine's Day, he gave me a single red rose, "because he knew I needed it," a mini rose bush "so I would always have roses blooming in my house," and a 6 month old black cat. I was thrilled! Scott had never been very good at romantic things, but he couldn't have hit the nail more on the head. At first, I named my cat Ben. When I told Scott the name, he got very angry. I couldn't imagine what he was angry at, and calmed him down and asked. He reminded me that the guy I had date prior to him, was not only his fraternity brother, but also named Ben. How could I name my cat after him!? I was floored. I hadn't thought about Ben in months. I just liked the name. It was a complete accident, so I promised to change the name. One night while watching E.R., I heard the name Luka. I liked it. I asked my cat if he liked it, and he looked up at me, as though he did, so I looked up the name in on a baby naming website, to make sure it didn't mean "the devil's spawn" or anything, and found out it meant, "bringer of light." That was perfect. He was my light. He brought me a lot of happiness and fulfilled something that had been missing. So from that day on, that cute little black kitty has been Luka. After the E.R. character, not the song. At the time we lived in a tiny 415 sq. ft. apartment with a loft that was gotten to by ladder. I put Luka's litter box up in the loft, as I never used it, and taught him how to climb a ladder. He loved it. He would run a track that he had created through my apartment. Into the kitchen to slide on the linoleum, around in a tight circle, through the living room, into the bedroom, over the bed, along the sliding glass doors, through the levolor blinds "clatter, clatter, clatter," up the ladder, tight circle down the ladder into the kitchen, and it all started again. This routine only bothered me at 2am when I was sleeping. He was the most sveldt cat I have ever seen. He literally had muscles. His little hips were rippling from that ladder. When I went to grad school, I had one of the best roommates ever, Jen. She was completely laid back and loved Luka. Her boyfriend moved down to Austin to be with her about a week after we moved in. He stayed with us for about three days while he looked for a place, and he left some of his stuff in the apartment while he was there, including a slatted futon couch. The futon was leaned up against the wall with the slats parallel to the floor. It looked sort of like a ladder. Luka agreed. The same day it was leaned up on the wall, we walked in to find him climbing the "ladder!" He had gotten himself stuck about two thirds of the way up, because it was steeper than the ladder he was used to. We took him down, and found him there again the next day. He played on that thing until Luke moved out. Luka alway had attention in that apartment. If I wasn't there, Jen was, or Jen and Luke were. He was well loved. So when I moved back to Dallas, I felt a huge tinge of guilt at the thought of leaving him alone all day. I knew cats were supposed to like being alone, but having seen them together in pairs my whole life, and knowing how social Luka was, I just could bear it. I got him a kitten. A half siamese, half tabby kitten. Luka had always loved to wrestle. With me. He would hide around a corner and jump out at my legs as I walked by, or if I was sitting on the floor, he would run up behind me and jump with his front legs spread out like a flying squirrel and adhere himself to my back and then bite me. It was all a game to him and I never really discouraged it because he never drew blood biting, and only scratched me when I was negligent with his nails. But sure enough, he decided this was a good game to play with his new comrad. Brody, named after Adrian Brody (who won an Oscar the night I named Brody), would be innocently playing and WHAM! ATTACK! I had to teach Luka 'Mercy'. When Luka hurt Brody, he would naturally cry out, so I taught them that if Brody cried once, that was a warning. Like crying "Uncle" when you were a kid. If Brody cried out again, Luka was in trouble. He would get squirted with a water bottle. It worked really well. Except, now, if Brody cries out twice, Luka gives him a really good attack after I yell at them, almost to say, "you stupid brat! You got me in trouble! You're gonna get it for that!!" Luka doesn't dislike Brody, but I think he feels much like the only child who suddenly has to share the attention with a new sibling. He is also significantly smarter than Brody. Brody and his siblings were on a lot of medication as kittens due to an illness his mother had gotten and passed on to the kittens. I have long thought this may have given him a bit of brain damage. On top of his slowness, he is also cross-eyed...curtosy of his Siamese ancestors. His has brillant blue eyes, but they point slightly inward. I think this makes it exceedingly hard to see properly. Try it, cross your eyes and try to focus. You can't. Lately he seems to have figured out a way to look at you through one eye and let the other one relax. But this has the odd effect of making him look as though he is looking past you instead of at you, because only one eye is trained on you and the other one is pointing the other way. My cats bring me great joy. I can't imagine not having them. They greet me when I come home, they entertain me when they play, the comfort me when I am sick or sad. And boy do they listen! Never interrupting me, never telling me I'm a fool. And when I come home from a trip, it's like their long lost mother has come home. They meow, and rub up against me, and follow me, and curl up as close as possible to me. They make me feel loved. So if I talk about my cats, know that they are more than just pets. They are part of who I am. They have been a part of my entire life, and they help keep me sane. I hope you all have a similar relationship in your lives. Everyone should. Another shot from July 2. 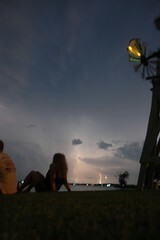 Notice the girl in the picture is not facing the lightening strike. That is because she is watching another one in front of her.